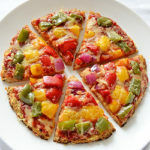 Cauliflower Crust Pizza - low-carb, low calorie, diabetic friendly way to enjoy your pizza. TOPPINGS: ketchup, vegetables, cheese, ham, olives etc. Steam riced cauliflower for 15-20 minutes or until soft. Instead of steaming, you can microwave or bake cauliflower in the oven. Let cool. Put cooled cauliflower in a linen tablecloth and squeeze out the liquid. Mix cauliflower with lightly beaten egg, cheese and seasonings. Pat into a round shape on the pizza pan lined with baking paper. Bake for about 10 minutes at 425oF. Take pizza out of the oven, top with toppings of your choice and return to the oven. Bake for another 10 minutes. *Riced cauliflower is grated or processed in a food processor until the texture resembles rice grains.